Emergencies are inevitable. That is why we make every effort to be available for your pet’s needs. During office hours, simply call the clinic to alert us that you are on your way. After hours, call the clinic. The answering machine will tell you how to reach the doctors. There will be a fee required upon emergency treatment for your animal. If the doctor would be unavailable, you can call the Fort Wayne Emergency Animal Clinic at (260) 426-1062. They are open from 6:00 P.M. to 8:00 A.M. on weekdays and have 24-hour service on weekends and holidays. You can transfer your pet to our clinic the following morning. 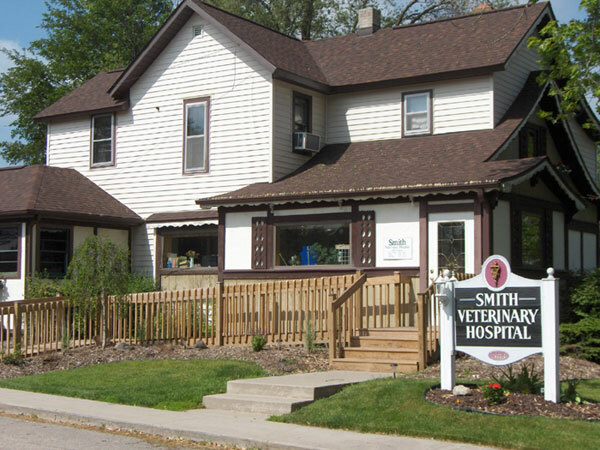 Smith Veterinary Hospital was established in May of 1976. 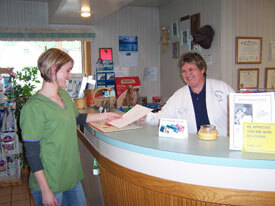 The practice was purchased from Deloss Fireoved, DVM, at which point the practice primarily focused on large animals. The building consisted of a waiting room and one general purpose room used as an exam room, pharmacy, lab area and surgery room. The clinic also featured a kennel room, one outside run and a big old red barn. Larry and Madge began coming to the practice twice a month in 1974 and 1975 while finishing their veterinary schooling at Purdue University. This allowed them both to help Dr. Fireoved and get to know the practice. Both doctors worked at the clinic on their externships although Dr. Larry also spent time at a large standardbred breeding farm in Lexington, Kentucky. The house was attached to the practice which made it an ideal place to practice veterinary medicine and start a family. The practice evolved until 1987 when it was 60% large animal and 40% small animal. Dr. Larry decided to attend seminary and the practice became 100% small animal under Dr. Madge. A few years after seminary, Dr. Larry returned to the practice with the goal of practicing exclusively equine medicine. As Smith Vet grew, personnel were added. Jenni Yager has been with us for 32 years acting as an office manager and receptionist. Heading up the equine managerial duties is Valerie Smith. Handling all of the patient care is our Registered Veterinary Technician Dustin Arnold, who has been with us for ten years. We always have several area high school students that have an interest in veterinary medicine working as veterinary assistants. At any given time, we usually have a high school or college student learning with us in an externship. In 1993 and 1994 the hospital went through some major remodeling. Working evenings and weekends, with the help of friends and family, the outside was given the “Berne Swiss” look and the lower level of the house was changed into additional hospital space. The upstairs changed into an office area, staff lunchroom and storage area. The present building consists of a large reception area, conference room, treatment room, hospitalization ward, surgery prep room and our companion animal surgery room. We also have a kennel area including stainless steel cages, six spacious indoor runs and three totally enclosed outdoor runs. While we no longer treat horses, our equine area has three large stalls, an equine treatment area complete with stocks and shares the surgery room with the small animal division. This up to date facility allows us to provide the best medical and surgical care available, including such things as radiology, in house lab work, endoscopy, ultrasound, dentistry and gas inhalant anesthesia and monitoring. Payment is expected at the time services are rendered. We do accept cash, checks, and all major credit cards as well as Care Credit. In the case of an emergency or an unusually costly procedure, we will work with you to come up with a suitable financial arrangement.